Citrus are so ubiquitous in Southern California that you might think they’re native, and they’re so easy to grow here that I’ve gone for planting multiple varieties in my yard with the aim of getting fresh fruit off the trees almost every month of the year. 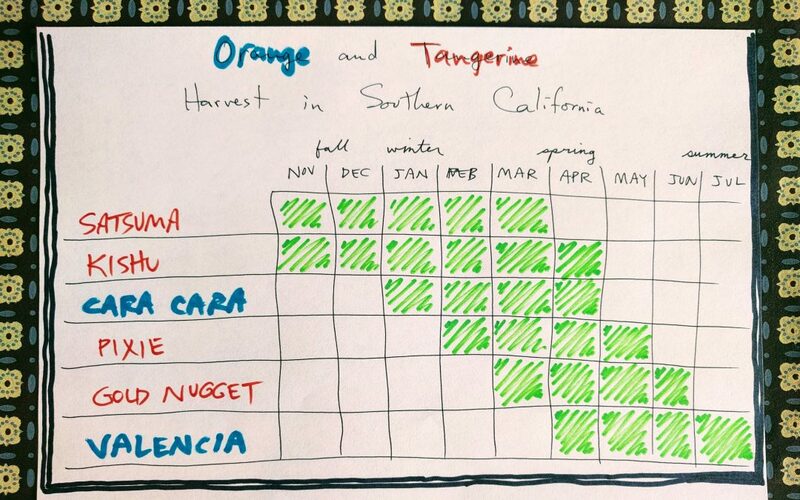 While I do have some other types of citrus, the chart above shows the varieties of oranges and mandarins that I grow, along with the months in which their fruit taste best in my yard (twenty miles from the ocean in San Diego County). The eating year basically runs like this: little mandarins starting in the fall, then peeling oranges in the winter, then bigger mandarins in the spring, and finally, slicing oranges in the spring through summer. While I’m no citrus expert, nor have I tasted every cultivar of sweet orange or mandarin, I did grow up in a Southern California town that had been established as citrus groves (Glendora), and in fact I attended Citrus College, so throughout my youth I ran through orchards and tasted most all of the common kinds, including the old school, seedy types like Dancy tangerine, a tree of which my grandparents had in their yard. Also, I’ve been lucky enough to tour the Citrus Variety Collection at the University of California, Riverside where one can taste about a thousand different kinds of citrus fresh off the trees — no exaggeration, they have about a thousand citrus varieties growing there! During my tour (part of which was videoed and posted on YouTube), I tasted most of the newer kinds of oranges and mandarins that can be purchased as plants at nurseries in Southern California these days. When I moved to a new house in 2013, I based my decisions on what to grow in my new yard on those experiences: my citrus-eating youth and my tasting of new varieties at U.C.R. The Kishu, also called Seedless Kishu or Kishu Mini, is the best fruit tree for kids. 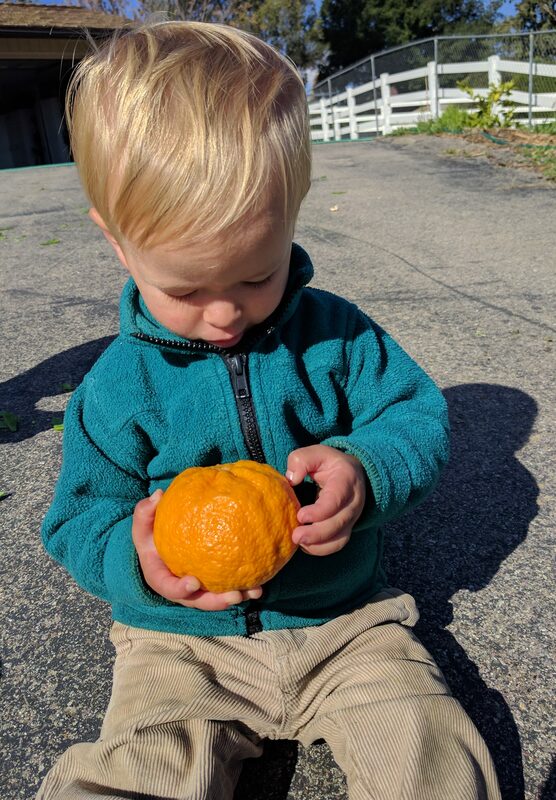 I wrote about why it’s God’s gift to children here, but in summary, the mandarins are not much bigger than a golf ball, the rind comes off so easily that you can peel it one handed, and, “It’s a burst of tangy sugar!” I wrote in my notebook during the tour at U.C.R. I wanted a peeling orange, but instead of the standard Washington navel, which I grew up eating off of my grandparents’ trees, I decided to go with a slight twist and plant a Cara Cara navel orange tree. It is simply a Washington navel gone pink; a Washington navel tree growing in Venezuela was found with one branch producing fruit that was pink inside. The taste of Washington and Cara Cara are essentially the same — that is, mostly sweet with little bite — and both have large juice vesicles. Gold Nugget mandarins are seedless and sweet, and Pixie mandarins are seedless and sweet, too. They’re both ripe from spring into summer. Why not just plant a Pixie or a Gold Nugget? For the same reason that I planted both a Kishu and a Satsuma for the fall into winter period: mandarins can have on and off years, but we don’t want to ever be lacking fresh mandarin fruit. It’s insurance. And to my taste buds, the Pixie and Gold Nugget mandarins have a certain richness and uniqueness to their sweetness that I enjoy. They’re also easy to peel, which isn’t unimportant. Speaking of peels, Gold Nuggets have the bumpiest, and some would say ugliest, peel of any mandarin I’ve seen, which is fun because it belies the fine flavor of the flesh inside. You’ll notice three common threads: great taste, easy to peel, and seedless. All of my choices have those qualities. The reasoning is simple. Why grow a tree whose fruit is hard to peel and seedy when you can grow a tree whose fruit tastes just as good but is easy to peel and seedless? Anyway, this monster of a Valencia orange tree takes us through summer. We not only eat its fruit through the hot months, but we use its canopy to sit under, we’ve hung a swing off of one branch, there are coffee plants and raspberry canes planted under its eastern drip line for afternoon shade. It really does take us through summer. But come September and October we’re pretty much without fresh oranges and mandarins. Wah, wah. Two empty months. Rough life. I have a wonderful mandarin tree – don’t know the variety. Is there a way I can find out what kind it is? Also it is leaning more to 1 side and I am worried it may fall over. Do I need to somehow stake it – it is about 12 years old. We planted it along our property line and next to our neighbor’s hedge property line. It is about 5 feet away from the hedge but am wondering if it is leaning just because it needs to be topped off. I just don’t want it to fall over! We do not overwater it. You could also give me a description of the fruit and I’d make my best guess. Just found your blog and I am hooked! I live in Orange County, have 4 hardworking backyard chickens and grow avocados, 3 types of citrus and lots of veggies. Where do you buy your citrus trees? I would like to add a ruby red grapefruit and another mandarin to our yard and my husband thinks it would be ok to buy a tree from Home Depot. I would like to ensure a healthy young tree, and feel like often the trees at HD often look stressed. Looking forward to your recommendation for a nursery or grower with great trees! Thank you! I kind of agree with both you and your husband, actually. 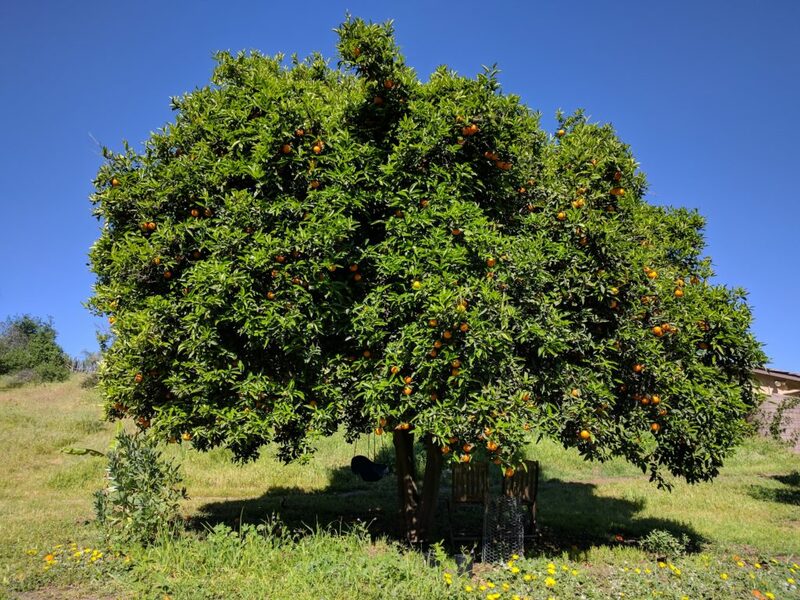 This question about where to buy citrus trees (and fruit trees in general) is a topic that has been on my mind a lot over the last few weeks. Thanks for the prompt, and see you on Friday morning with, hopefully, some helpful information. Wow!! 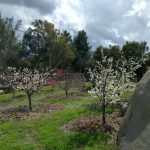 Thank you for the post on where to buy fruit trees! Great post with so much great information. Thank you!! Hope you enjoyed all the rain! I read the posts on your rain barrels / cisterns and now I’m trying to inspire my husband to install one! I saw the so cal metropolitan water district is even offering rebates on large rain cisterns. So that seems like a good incentive. Thank you for this website, it’s such an amazing resource!! Do you have any experience growing blood oranges? My wife and I are motivated to plant a Blood Orange and Cara Cara Navel tree because of their distinct health benefits (Anthocyanin and Lycopene) but I don’t know which blood variety to pick. Of the 3 main options (Sanguinello, Moro, Tarocco) do you have any suggestions? Thanks for all the great posts. 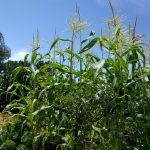 My wife and I are excited about growing our own food, especially healthy foods and your website is a wealth of knowledge. Thank you, Eric. Providing solid info for you and your wife is exactly my goal. I’ve never tasted a Sanguinelli, but between the Tarocco and Moro I slightly prefer Tarocco. I like my oranges on the sweet side, and Tarocco gets sweeter and fuller of flavor than Moro — to my taste, anyway. My wife actually really likes Moro though, and she likes tart citrus. For example, she prefers to eat mandarins and oranges earlier in their seasons than I do. But in terms of bloodiness, Moro definitely wins. It gets so bloody that I’ve seen the entire interior turn almost uniformly purple. Tarocco, by comparison, tends to be more streaked. Both Moro and Tarocco are totally worth growing, but I’d grow whichever one fits your preferred taste, tarter (Moro) or sweeter (Tarocco). Awesome thanks, I think we might just plant them both…another question (or two). I stopped by Home Depot yesterday and they have a Red Valencia which looked interesting, do you have any experience with that one? When I looked it up online it’s called Smith Red Valencia, apparently it’s an orange and not a blood orange with a slightly longer harvest time versus regular valencia. 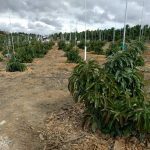 But these terms are not standardized let alone regulated, and there are different rootstocks used for different citrus scion varieties that have varying degrees of dwarfing effects on each. As for a Durling-grown tree specifically, I happened to look into this some years back when I bought my first Kishu tree grown by them. Durling said they use Rubidoux trifoliate rootstock for trees that they write “dwarf” on the container, which are then labelled “semi-dwarf” on the tag — a confusing practice! Anyway, the bottom line is that you shouldn’t think of that Kishu as a true dwarf. Most people agree that the only true dwarf rootstock for citrus is one called Flying Dragon. If Durling ever uses it, they said they write “ultra-dwarf” on the container. I’m sure we’re not the first to wonder about this issue, and it would probably be useful to write a full post on it. I should do it soon while people are in the citrus-planting mood, huh? Yes, when large oranges are young they look like green golf balls. My Valencia oranges look like that right now, but my navel oranges are a little bigger than golf balls already here in mid-August. You’ll see them turn orange after Thanksgiving if the fruit are oranges (or mandarins). By that time they’ll also be about mature size. If you’re really eager, you can send me photos of the trees and I can make my best guess based on the foliage. Or if you still aren’t sure after eating the fruit this winter which kind they are, then let me know. 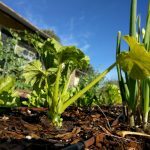 Just wanted to say how much I love your whole site, it has truly shortened my learning curve tremendously, for my grove and my garden beds. I’m in Fallbrook so our climate is probably pretty similar, so based on your posts, I just bought an Algerian, Tango, Satsuma, Kishu and Gold Nugget which will all get planted this weekend. I got all these from Maddock Nursery in Fallbrook but they get their stock from Durling. I also went to Four Winds website and landed a USDA 88-2 Mandarin (plus two Olive trees) and I can’t wait to try it when it starts giving me fruit. Based on your other post about which Avocados to plant, I scored a Hass, a Reed and a Fuerte. Can’t wait to plant them and get some of my own fruit from them. I’ve set up all my watering just like you show in your posts. Great stuff, thanks again. Thank you so much for writing. 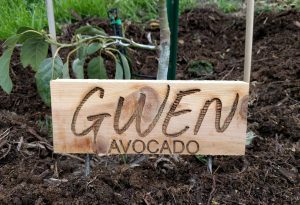 And sorry about the delayed reply: I was actually up your way the last couple days visiting some avocado groves in Fallbrook/De Luz/Temecula. I’m so glad you mentioned getting the USDA 88-2 from Four Winds because I hadn’t known they were selling it and I’d been planning to finally get my own budwood from UC Riverside and make a tree this coming spring. No need for that now. I just bought one from Four Winds too. I’m confident you are going to love the mandarins and avocados coming off those trees in the next few years. Keep me updated on how they’re doing, and especially how the USDA 88-2 is doing. You and I will be the only ones I know who are growing them in a backyard situation. We love the mandarins you buy at Costco or in the store that are labeled, Clementines or Little Cuties. What type of mandarin are they? One cultivar that I have been told is grown and sold as “Cuties” is the Algerian clementine. Here are photos and descriptions of Algerian clementines on U.C. Riverside’s Citrus Variety Collection website. You probably don’t want to try to do that in your yard so a great alternative would be a mandarin variety called Tango. It is a seedless version of another mandarin that is similar to the clementines called W. Murcott Afourer. Here is the webpage for Tango. Tangos taste great and Tango trees are widely available at nurseries.